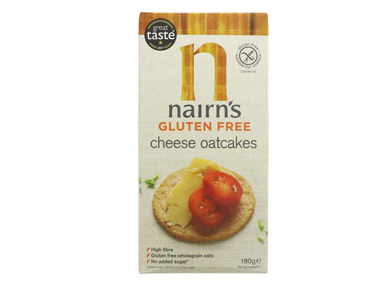 Buy Nairn's Gluten Free Cheese Oatcakes 180g in the UK from our online shop or directly from our independent Scottish store. Nairn's gluten free oats are carefully sourced, farmed and milled to ensure they are safe to eat. At Nairn's, they know our oats - they've been baking with them since 1896. And that's why they've created a delicious gluten free range that everyone can enjoy. Nairns understands that being diagnosed with gluten intolerance entails dramatic changes in a person's dietary habits. Their aim is to provide a range of oaty food which provides coeliacs with the same freedom and choice as others. Nairns strive to produce gluten free oat snacks and food which are as tasty and wholesome as possible. Naturally, oats don't contain gluten but can be contaminated by other grains. Nairn's gluten free oats are carefully sourced, farmed and milled to ensure they are safe to eat. We bake all our products in a dedicated gluten free bakery, testing every batch to Elisa standards. Gluten free wholegrain oats (76%), cheese (15%) (milk), sustainable palm fruit oil, sea salt, raising agents (sodium bicarbonate, ammonium bicarbonate). Where can you buy real Gluten Free Cheese Oatcakes safely online? If you are wondering where you can buy Nairn's Gluten Free Cheese Oatcakes 180g safely online in the UK, then shop with us. Gluten Free Cheese Oatcakes - Nairn's Gluten Free Cheese Oatcakes 180g in Oatcakes & Oat Biscuits and Biscuits & Breads.